A 15 track song cycle and a return to Plunge's original instrumentation of two-basses with drums but this time adding B3 organ and saxes. Provocative story, monstrous grooves, expansive improvisation . . . the most adventurous and muscular Plunge outing yet! 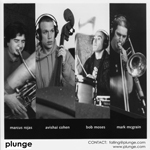 Mark McGrain & PLUNGE have finished recording and are currently mixing a new album for release in Spring 2015. “IN for the OUT” is not only a return to the drum and bass driven “grooves as wide as a house” (DownBeat Mag.) 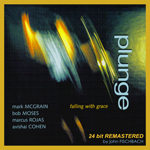 concept of their first album “Falling With Grace” but also includes the intimate trio and improvisational elements of “Dancing on Thin Ice” and “Tin Fish Tango.” Joining trombonist/composer Mark McGrain on this record are organist Robert Walter, drummer Simon Lott, sousaphonist Kirk Joseph, bassist James Singleton, saxophonist/flautist Tom Fitzpatrick and the late Tim Green on saxello and baritone sax. 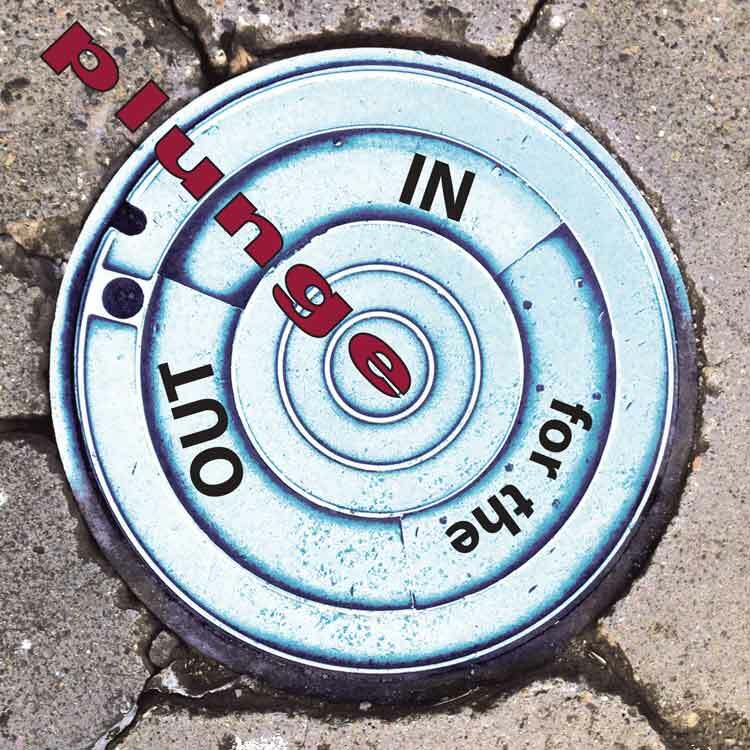 Recorded during two sessions at Esplanade Studios, New Orleans in April of 2014 by Misha Kachkachishvili and mixed by Tom Dube, “IN for the OUT” is PLUNGE’s most adventurous and muscular outing to date. 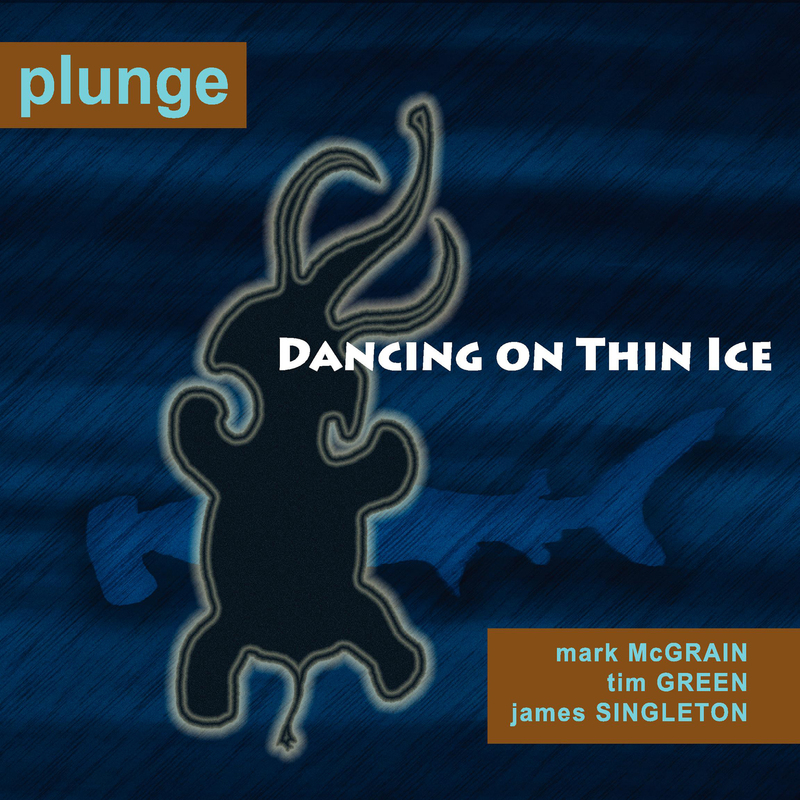 All three of Plunge's critically acclaimed albums, Tin Fish Tango, Dancing on Thin Ice, and Falling With Grace have ranked in the National CMJ-Jazz Radio Top-10 ! Featured on NPR's - All Things Considered and reviewed on NPR/PRI's Monitor Radio - Included in DownBeat Magazine's Blindfold Test and Hot Box sections receiving consecutive four star reviews. Plunge’s third album; second as a drum-less trio. 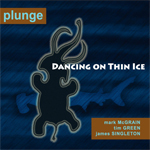 With Tin Fish Tango, composer/trombonist Mark McGrain débuts ten new pieces and three collaborative trio improvisations. With him are fellow New Orleanians Tim Green, saxophones, and James Singleton, bass. Dirty Dozen Brass Band sousaphonist, Kirk Joseph jumps in on two tracks (#3. 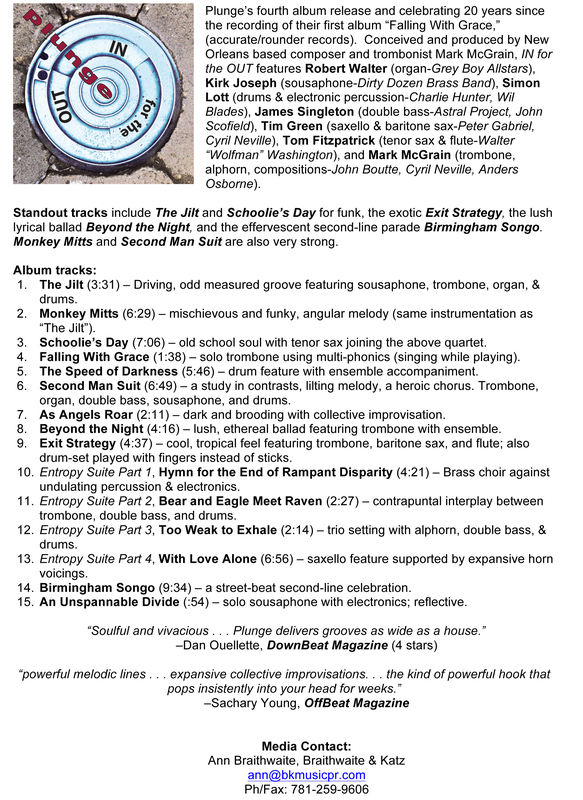 Huff-A-Round and #6, Big Bhang Theory) and Tom Fitzpatrick, saxophones, replaces Tim Green on 6 of the 13 tracks. McGrain’s compositions continue on the course of less is more while melding memorable themes with open improvisation. Adventurous; while remaining elegantly economical to the end, Tin Fish Tango may be Plunge’s most complete recording to date. 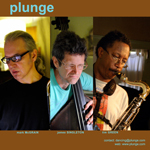 DownBeat music critic John McDonough describes Plunge’s sound this way: "Tenor and trombone create a scrupulously pristine musical pastel, reminiscent of Stan Getz and J.J. Johnson, perhaps, but with a far more risky and adventurous agenda (4 stars & HotBox feature album)." Aaron LaFont of OffBeat Magazine, "exhilarating, post-bop fare suffuse with tight, interlocking melodies and cool, nimble grooves." "A wonderfully courageous and risky jazz record." writes Jordan Richardson of Blogcritics.org. "It is unsafe in the best of ways and features a group in full command of their art." Bassist JAMES SINGLETON is a stalwart of the New Orleans music scene whose performance and recording credits include James Booker, Professor Longhair, Johnny Vidacovich, John Cleary, Astral Project, Joe Henderson, Milt Jackson, Eddie Harris, Clark Terry, John Scofield, and Dave Liebman, to name only a few. 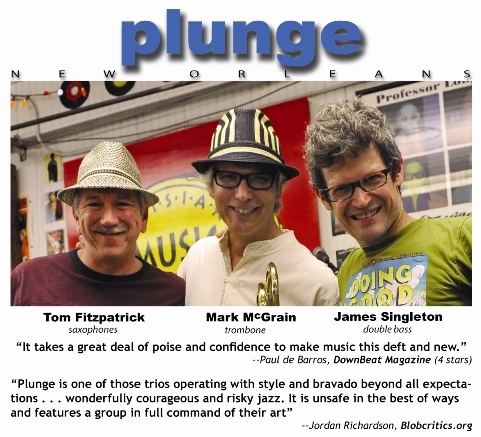 TOM FITZPATRICK is a native New Orleanian and life-long professional saxophonist. A long-time member of Walter "Wolfman" Washington’s band, The Road Masters, Tom is one of the funkiest (and busiest) reed players at work in the Crescent City. Saxophonist TIM GREEN is one of the finest saxophone players in New Orleans, and one of the most sought after musicians around the country for both session work and gigs. 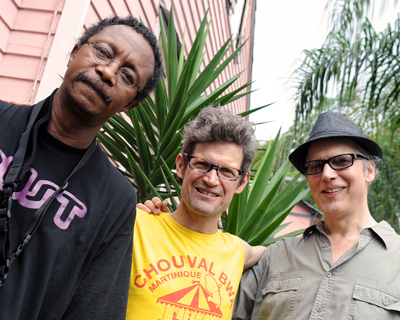 Tim has worked with Herbie Hancock, Peter Gabriel, Cyril Neville, Robert Walter, Anders Osborne, Juanita Brooks, and countless others. 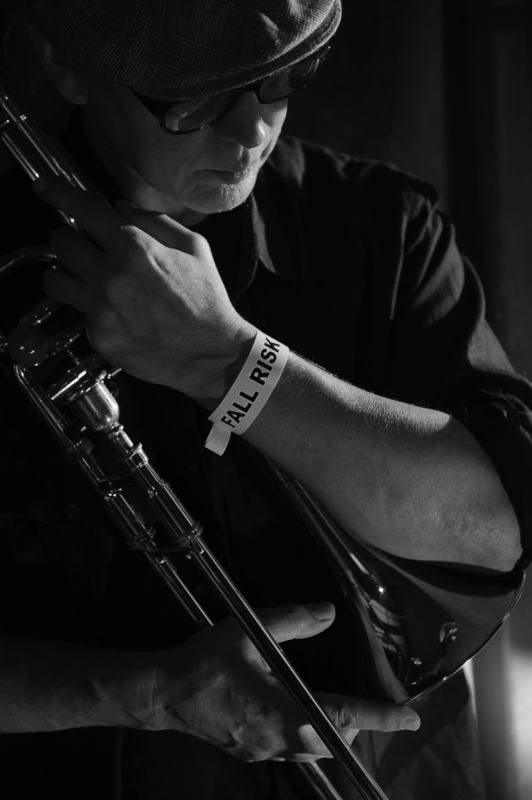 KIRK JOSEPH is a founding member, and long time anchor of the Dirty Dozen Brass Band. He has defined modern New Orleans tuba playing. The son of legendary New Orleans trombonist Waldren "Frog" Joseph, Kirk grew up playing traditional jazz and second-line street music. He gradually incorporated components of modern jazz, funk, blues, and rock & roll into his own personal style -- a style that has influenced tuba and bass players around the world. 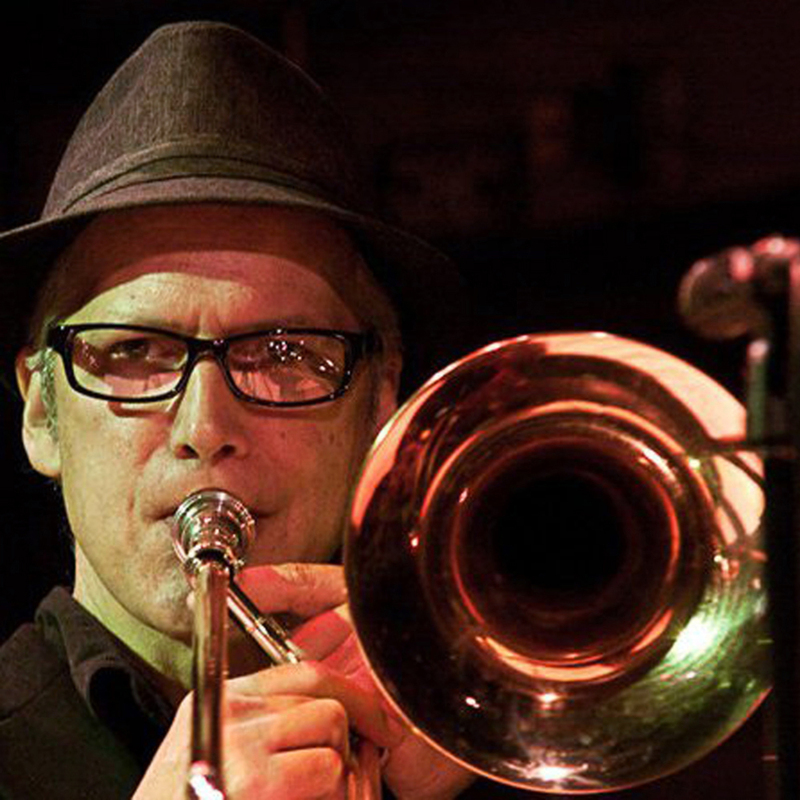 Trombonist and Composer MARK McGRAIN, has lived and performed in New Orleans since 1996. During that time, he has appeared with Irma Thomas, John Boutte, Cyril Neville, Anders Osborne, Medeski, Martin & Wood, and many others. His resume also includes scoring for PBS, private commissions and commercial ad spots; a long-time faculty member at Berklee College of Music, author of the textbook Music Notation (Hal. Leonard pub.). 1. Tin Fish Tango (4:16) – Tango, bass featured at intro – solos are brief and trade in turn. 2. Bright Side (7:01) – Up tempo, forward moving with a strong melodic theme. 3. Huff-A-Round* (5:50) – Funky, tuba driven. Playful improvisations passed around (Kirk Joseph, Sousaphone). 4. No Spill, Spew! (3:02) – Trio improvisation. Fast, driven. 5. Strollin’ with Sidney* (4:13) – Easy striding groove and whistle-able melody – reflective solo section. 6. Life Lite* (4:09) - Bright tempo. Arco bass and tenor melody atop the trombone ostinato. A bass feature. 7. 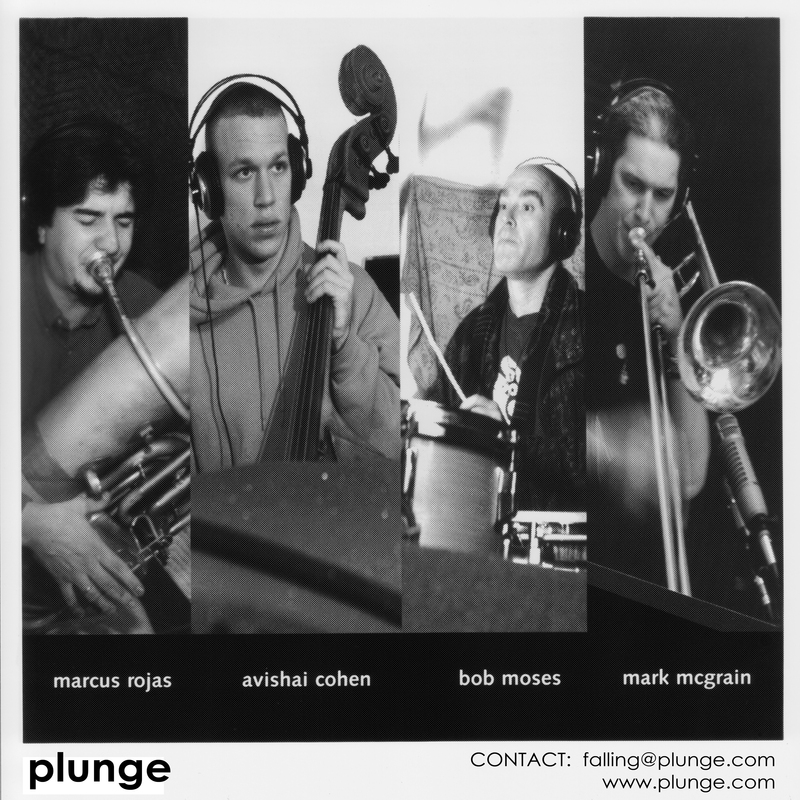 Big Bhang Theory* (9:09) – Tuba rooted jazz waltz with melodic two part horn writing. 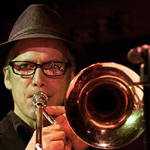 Easy feel – slightly angular (Kirk Joseph, Sousaphone). 8. Pelican Down (4:24) – Trio improvisation. Reflective. 9. The Kroop* (5:46) – Stop-time blues feel. Plunger voiced, tail-gate trombone melody. Gritty. 10. Love’s Wildest Talent (3:42) – Eligant, spacious ballad. Compositional, including the improvisations. 11. Jugs (3:19) – Romping, funky swing groove; percussive. Open improvised solos. 12. Lost to the Vapors (4:24) – Trio improvisation. Airy, mysterious. Listen for the melodic whistling at the end. 13. Diddlin’ *(8:34) – Swinging, bluesy. Cool walking bass and swaggering horn riffs. Click here for full=resolution jpg. Plunge ™ is a registered trademark.